I have not yet jumped on the Kindle/Nook/e-reader train, but I am warming up to the idea. I've played around with my friend's Kindle and while it's nice I'm not ready to buy one yet. I don't think I would prefer an e-reader to an actual paper novel - I can't take the Kindle in the bath with me, can I? Well I CAN but it probably wouldn't be a good idea! While I wouldn't want to read an entire novel using the Kindle app on my phone, I have found that many people are now selling short stories through the Kindle store and they are the perfect length for reading in those few minutes while I'm riding in the car or waiting at the doctor's office. And many of them are only $0.99! This is great because, for the most part, you won't find these short stories anywhere else. Sure, some of them have been published in magazines or short story collections but many of them are out of print or hard to find. 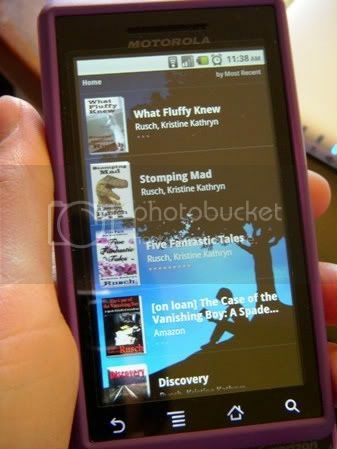 My favorite short story Kindle author so far is Kristine Kathryn Rusch. She has lots of short stories, varying from mystery to fantasy to science fiction. My two favorites are The Case of the Vanishing Boy (a mystery set at a sci-fi convention!) and The Secret Lives of Cats (a mystery solved by cats!). She also has several collections, such as Five Fantastic Tales where you get five fantasy stories for $2.99. These are short stories so most can be read in twenty minutes or so. Short stories don't often list page counts so it's hard to judge their length, but most of Rusch's stories are between 20-50 KB. Many will let you preview a certain percent of the story and that can give you a bit of an idea as to how long it is. The picture above gives you an idea of how the text looks on the Droid. It's easy to read and if you have bad eyes like me you can make the text larger. And the Droid is backlit unlike the Kindle, which needs an external light to be read at night. That means I can read it in bed or in the car after dark without bugging my husband with a light. 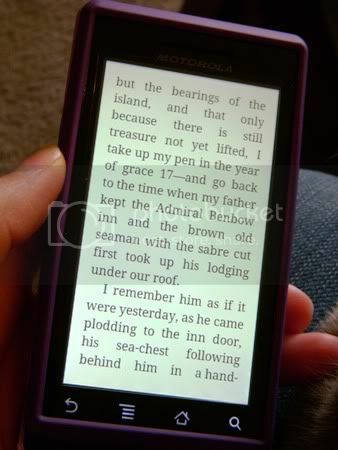 Again, I wouldn't want to read a whole book on my Droid (I think I'd go blind) but for short stories it's perfect! I've read 14 complete novels on my iPhone Kindle. I have mine set to the smallest text size and actually wish it could go smaller. Flipping the page every 15 seconds is pretty distracting. One of the novels was Treasure Island. Is it just me or is Jim Hawkins kind of a moron in the book? Wow, fourteen? I guess it is possible! But then your eyesight is much better than mine so you can stand to stare at that tiny screen all day. It's been a while since I read Treasure Island but I do remember Jim not being as awesome as he is in the movie.